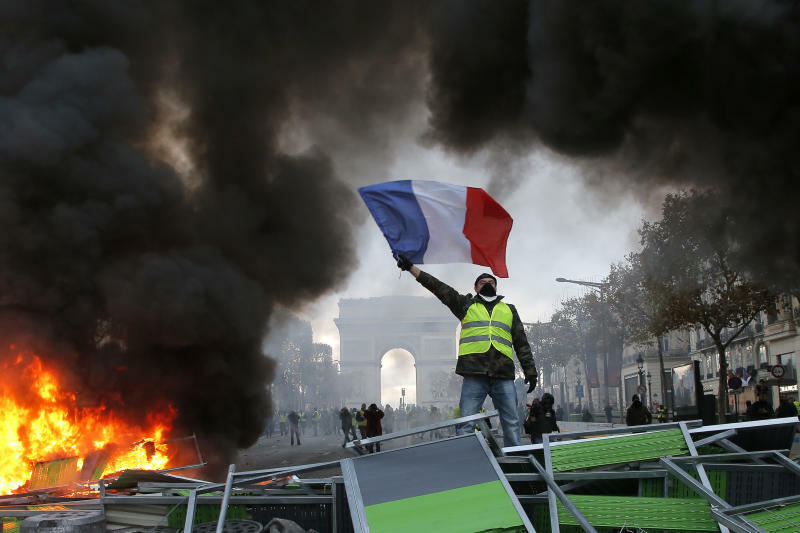 PARIS (AP) — French workers riot in the streets over tax hikes, economic inequality and perceptions that the country's rulers are out of touch. Macron, a former Rothschild banker whom critics accuse of being a "friend of the rich," stoked popular anger for doing away with a wealth tax last year and proposing to raise fuel taxes that campaigners say will hurt the poorest. 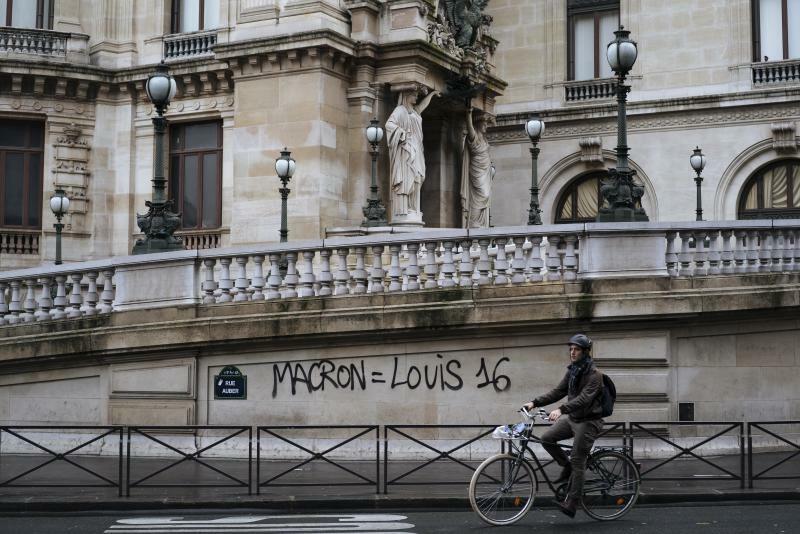 Against this energy tax, "Yellow Vest" protesters carried out Paris' worst rioting in decades this weekend, looting and torching cars in plush neighborhoods near the Champs-Elysees Avenue and graffitiing "Macron=Louis 16." Hundreds have been injured in the protests over recent weeks, and four people have been killed. "If people compare Macron to Louis XVI it's a warning that he has hasn't learned the lesson of history. They don't literally want his head, but it's a strong message that they don't feel listened to," said sociologist Michel Wieviorka. The concessions haven't appeased the protesters who now want more. With wages stagnant and frustration at France's taxes, among the highest in Europe, some Yellow Vests — named after the emergency motorists' jackets that they wear — now want to topple the government. More protests are planned for the weekend. 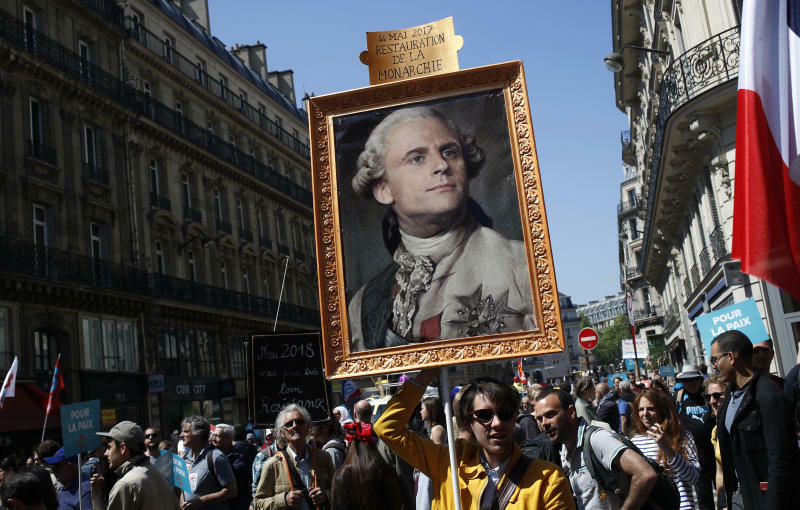 Protest is such a recurrent part of French history simply because it has often succeeded. Paris' very design was intended to thwart mass protest after the 19th-century revolutions that toppled monarchies. "The founding moment of French political history was the Revolution. Since then, French people speak directly to power through protest. Although not necessarily in such a bloody way," Wieviorka said. Giant demonstrations also forced the French government to ditch the reform of university selection in 1986, the reform of public transport workers' pensions in 1995, and the introduction of a lower wage scale for recent university graduates in 2006. The tumult following 1830's Revolution was immortalized in Victor Hugo's "Les Miserables," a classic of French literature later carried around the world as one of the greatest musicals of all time, when it culminates in a confrontation on the Paris barricades during the 1832 uprising. "In part, the big boulevards that converge can help stop more protests from happening," Wieviorka said, referring to areas such as the Place de l'Etoile — the location of the Arc de Triomphe. But the country's rich history of protest has endured all attempts to stymie it, as the Yellow Vest protesters who tore apart the Champs-Elysees this weekend demonstrated: they were seen still erecting barricades.